Nobody likes being cancelled on. Especially after driving or waiting for 5 minutes. But sometimes things don’t go as planned. Maybe you keyed in the wrong pick-up point, or your driver is stuck in traffic. These things happen. Which is why we’ve made improvements to our Cancellation Policy* to take into account these factors. Here are some questions that you may have with regard to the the revised policy. *This applies to all transport services except GrabHitch, GrabShuttle and GrabShuttle Plus. What is the updated policy and how is this different from the previous one? Why is the cancellation policy being revised? We understand that some factors like road conditions aren’t within your or your driver’s control, and that sometimes mistakes like keying in a wrong pick up location happen. The new policy takes these factors into account to allow flexibility for everyone, while still being fair. If you’re made to wait for more than 5 minutes after the indicated ETA, you’ll be allowed to cancel your ride with no fee. Conversely if you cancel after 5 minutes your driver will receive a $4 compensation from you to make up for the time, petrol and effort he took getting to you. Any fee incurred will be deducted directly from your Grab account. For passengers using cash, the fee will be added automatically to your next ride’s fare. Your next driver will be informed to collect this additional amount. What if I cancel because my driver is not moving, or taking too long to arrive? Will I be charged? We encourage you to first check in with your driver via a call or GrabChat. He/she might be caught in heavy traffic, or might have accidentally missed a turn. If there’s still a need to cancel because your ride’s taking much longer than indicated to arrive, you will not be charged. Just as we’re able to show you your driver’s current location, we have safeguards in place to detect if the driver’s not moving towards you. Cancellation fees will also be waived if your driver does not arrive within 5 minutes after the first-shown estimated time of arrival. For example, if you are allocated a driver who is 3 minutes away, and you’ve waited for more than 8 minutes (i.e. 3 mins + 5 mins), your cancellation will be free. What if my driver hasn’t arrived, but has indicated otherwise? You will not be charged the $4 cancellation fee if any of the above are not fulfilled. Please do reach out to us via our in-app Help Centre if you feel you have been charged unfairly or wrongly, and we’ll be happy to assist you. My driver cancelled the ride immediately after arriving and did not wait for me. Will I still be charged? No, all drivers will need to wait for at least 5 minutes (or 3 minutes for GrabShare) before you will be charged. No charges will be incurred if your driver cancels the ride before the waiting time is up. Will my driver be penalized for cancelling on me? How will I be compensated when that happens? We have processes in place to ensure that our drivers do not cancel on you. 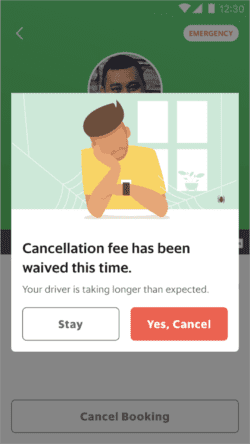 In order to qualify for incentives, drivers are held accountable to their cancellation rate. We also reward drivers with a far pick up bonus. This all works in minimising cancelled trips from your driver. In the event that this happens, you will be compensated with 100 GrabReward points and be automatically re-allocated with the next available and closest driver. Why am I getting drivers who are still dropping other passengers off? Our system allocates you to the nearest available driver to ensure that your waiting time will be kept at a minimal. If you have experienced getting a driver who is still dropping off his/her previous passenger, this is because they are the nearest available driver for your booking. 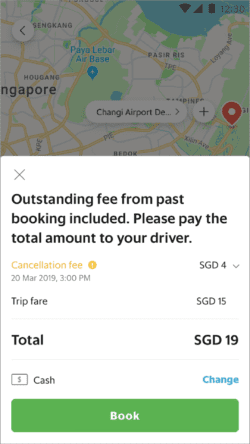 With this new policy, if you are allocated a driver who is too far away for you, you may now cancel your booking within 5 minutes (or 3 minutes on GrabShare) for free. We’re constantly introducing improvements to our system based on feedback from our users, and as part of our commitment to keep improving and drive a #bettereveryday for everyone. Need some assistance? Contact us via our in-app Help Centre and we’ll be happy to help!